Shri Advaita Acharya is a very important person to understand in the Krishna consciousness movement. His appearance day is tomorrow, or on Saturday, February 16th, 2013. (This is a blog I am "recycling" from 2 years ago. 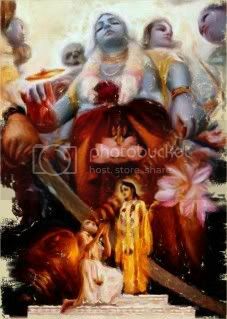 At the end, I also give links to two other blogs about Him) He is in the category of God, yet is also a great devotee of God. He is one of our many superlative family members and spiritual superheroes! Before I briefly speak on this, I thought it would be important to consider what someone from another religion might think of this day, and why: On appearance days, or so-called, “birth” anniversaries of great manifestations or incarnations of God, someone from another religion may criticize the observance. They may say, chidingly, “O, they are celebrating the birth of another one of their many Hare Krishna or Hindu gods”. Many people think that Hinduism (as the Vedic path is called in modern times) is about worship of many gods—and often strange ones at that! Or they may think we are animalist or worship forces in Nature and so on. Actually, the heart of the teaching of the Vedas, or Sanatan Dharma, is that there is one supreme spiritual force or God in the Universe and beyond it. Vaishnavism in particular is very all-encompassing. It incorporates, in the worship of the principle of the Supreme Godhead—who is the source, creator, and sustainer of the Universe—elements which might be considered on their own to be worship of God as an all-pervading impersonal energy, pantheism (God is the Universe), panentheism (God is within everything), and as I mentioned, animism. Thus, these aspects of Vaishnava philosophy must be seen as part of God’s supreme ruling power. In particular, Gaudiya Vaishnavism, sees Krishna as the supreme manifestation of Godhead, who is both the Universe, within the Universe, and beyond it—inconceivably one with everything, and yet independent or different from everything. Unfortunately, this detailed knowledge if not widely understood. Therefore, misunderstandings and lack of accurate information abound, and such scanty “knowledge” is actually ignorance. This ignorance is sadly used to bolster the faith of people in their religion! If our critics are at least willing to hear, some theological education is necessary. Otherwise, how can they make an informed analysis. We may wonder if they want to. It is natural that people like their form of religion (or sect) and consider it the best—otherwise, why should they be involved with their path to God? Never the less, it is also a good quality to be open to learn new things, and to consider that the faith and knowledge of others has value. If we are honest, we have to admit that we don’t know everything, and are far from perfect. Unfortunately, religion can be more sentimentality, or emotionalism, than true spiritual realization. Fanaticism is often the result of a lack of true spiritual wisdom, and the religious conflicts throughout history are brought about, not by saints or mystics, but by superficial religionists, whose weak faith and understanding is disguised as strong convictions. Since we are not completely convinced, we want to stamp out or kill those we think may challenge our belief. It seems on a primal level that it is thought to be easier to challenge or fight, than to dialog and share sincere discussion and contemplation. There exist today, a number of fear based religions who try to motivate followers by fear of hell, fear of following the devil or wrong path, or of having too much knowledge or philosophy, when all one needs is faith. In the current age of Kali, it is our experience that people would rather fight against something they don’t understand, than find common ground and unity in diversity. Beginning or neophyte religionists have a black and white understanding of God, which emphasizes the outward practices, rather than the actual goal—which may not really be understood. In fact great teachers often speak in such basic terms since it is the easiest for the masses to understand. Shri Advaita Acharya, was, as his name suggests, a learned scholar and teacher, not of advaita—impersonal—Vedanta (propagated by Adi Shakara), but of bhakti, or pure devotion. Thus, it is fitting that we began with spiritual philosophy on our meditation on this day, and his significance to those in the line of Shri Chaitanya. For “pastimes” or information about his life you can consult online—here on Krishna.com, or in the two scriptures I mention after the next sentence. In addition, there is the very fine book by Satyaraja Prabhu (Steven J. Rosen), “Sri Panca Tattva—The Five Features of God”. The name Advaita, means non-different from the Lord. Indeed Shri Advaita is considered an incarnation of the original form of Lord Vishnu in the scripture, Chaitanya Charitamrita, and also an incarnation of Sadashiva, or the original form of Lord Shiva in the Chaitanya Bhagavat. Other Vaishnava literature have harmonizes this by saying he was incarnations of both. You will often find that an incarnation is considered a manifestation of two or more persons—so you will have to get used to it, even if you can’t quite understand it. In understanding Shri Advaita Acharya, Shri Nityananda, Shri Chaitanya, Lord Krishna or a host of Avatars which are said to be unlimited in number, it will be helpful to accept the idea of “Godhead” being a spiritual substance or divine energy which can have unlimited manifestations. God is one, yet that “one” is unlimited and ever expanding. Krishna, who Gaudiya Vaishnavas consider the ultimate original aspect of God (the fountainhead of all incarnations), has different desires, purposes, and necessities, and thus different forms. From another perspective, the type of love a devotee has for God, will manifest in a particular Divine form of the Godhead. Throughout the morning I was looking at Advaita Acharya's picture, praying for his mercy for spiritual advancement, and feeling grateful to be connected to such a generous, compassionate and kind manifestation of God. Some thoughts of his various lilas came to mind as well. For the purpose of ending this blog, I want to mention one of his most important roles in Chaitanya lila. Although Krishna’s will is sufficient for his decent, he creates certain spiritual necessities in the hearts of manifest devotees to warrant it, as well as material conditions to be corrected by his coming. In the Chaitanya Charitamrita it is considered that Advaita Acharya’s intense, earnest, and compassionate calling for the Lord’s advent, caused the Lord to descend to the material world. Thus we are so indebted to him, for without Shri Chaitanya and his representatives, we would be lost with little access to real spiritual life and the most sublime goal of prema. I have reasoned, that since Shri Advaita Acharya was the cause of the Lord’s advent, we can pray to him to enable Shri Chaitanya to live in our heart. Let it be so! Submitted by Karnamrita on Fri, 2013-02-15 16:28. Submitted by Karnamrita on Fri, 2013-02-15 21:13. Let me offer my loving obeisances to Srila Advaita Acarya, who worshiped Sri Gaura with tulasi leaves, flowers, water, and loud calls of love at the shore of the Ganges and begged Him to appear. Let me take shelter of Srila Advaita Acarya. 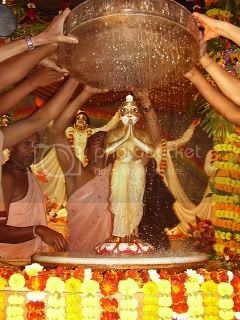 Attracted by his loud calls, the golden Lord of Goloka Vrindavana, who is an ocean of ecstatic love, appeared in Sri Navadvipa. Let me surrender to Srila Advaita Acarya. 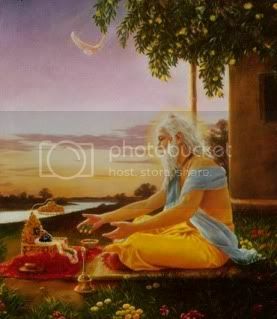 He inspired the rising of the moon of Sri Caitanya, who inundated the world with pure love of Godhead, prema, which is even for Lord Brahma and the great demigods difficult to attain. Let me offer my loving obeisances to Srila Advaita Acarya, whose mercy is beyond understanding and by whose request alone all-powerful Sri Caitanya disappeared from this world. Let me surrender to Srila Advaita Acarya, who is not different from the form of Maha-Vishnu and of whom Brahma, Vishnu, and Siva are a part, engaged in the creation, maintenance, and destruction of the worlds. Let me offer my loving obeisances to Srila Advaita Acarya, who is worshiped by all and who is attained only by devotional service. It is heard in certain Vedic literature, that because he is Lord Siva’s shelter, he has a name and glory like Lord Siva. Let me take shelter of Srila Advaita Acarya, who is filled with love for Sri Caitanya and whose beloved wife, Sitadevi, and son, Acyutananda, are also inundated with love. Let me offer my loving obeisances to Srila Advaita Acarya, whose heart is Sri Gaura’s eternal playground, who is named Advaita because he is not different (dvaita) from Sri Nityananda and who is named Acarya because he teaches devotional service. Any person who happily and attentively recites every morning these eight prayers, glorifying Sri Advaita, the husband of Sitadevi, attains pure loving devotion for his lotus feet and becomes very dear to him.